The culture-centred approach offered in this book argues that communication theorizing ought to locate culture at the centre of the communication process such that the theories are contextually embedded and co-constructed through dialogue with the cultural participants. 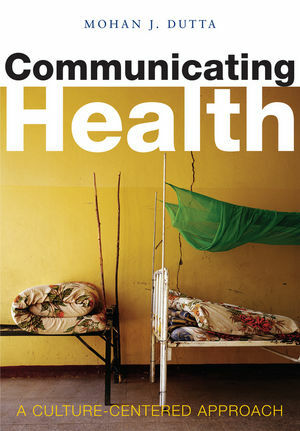 The discussions in the book situate health communication within local contexts by looking at identities, meanings and experiences of health among community members, and locating them in the realm of the structures that constitute health. The culturecentred approach foregrounds the voices of cultural members in the co-constructions of health risks and in the articulation of health problems facing communities. Ultimately, the book provides theoretical and practical suggestions for developing a culture-centred understanding of health communication processes. "If you are looking for a fresh approach to teaching health communication, Communicating Health provides a unique perspective that will leave readers with a feeling of sensitivity, a call to justice, and a knowledge bank of practical strategies from culture-centered healthcare." "Communicating Health is a most timely and critically important contribution to our global understanding of the location of culture in health communication. Drawing on multidisciplinary fields of scholarly traditions, Mohan Dutta offers sensitive yet compelling insights and critical thoughts that locate culture at the core of health communication. This is a book that should be read by everyone concerned about the role of health communication in achieving social justice, equity, and optimum health globally." "The book abounds with provocative and revealing examples that support conclusions and recommendations. It is equally valuable for health communication scholars and health promotion practitioners."